Coming to WWE from the sunny shores of SoCal Eva Marie is looking to build on her already impressive history with an equally exceptional future. Having been an actress (with appearances on HBO’s Entourage, CW’s 90210, and CBS’s CSI: NY, to name a few), magazine Cover Girl, fitness model, and star athlete, this California dream just added a new title to her resume – 2013 Diva Search winner. Growing up as a tomboy competing with her three older brothers, Eva Marie learned that it’s not enough to be pretty, you have to be tough. This combination of brain and beauty led her to victory at the 2012 Powertec Model & Fitness competition. And don’t be fooled into thinking this athleticism is only for show. Eva Marie was also captain of her soccer team at Diablo Valley College, where she was an All-American striker. Built for anything, but tailor made for the spotlight, Eva Marie will once again step in front of the cameras as a co-star on the E! 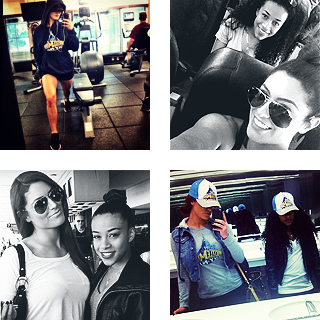 Network reality show Total Divas. Whether heating up the squared circle or the small screen, this relentlessly successful Diva has the tools to leave her mark in WWE. Marie made her debut on the July 1, 2013 episode of Raw, in an backstage segment along with Jo-Jo Offerman, Natalya, The Bella Twins and The Funkadactyls. Marie was announced as Natalya's protégé on the July 4 episode of WWE Superstars, during a match in which she accompanied Natalya to the ring where she defeated Naomi whom was accompanied by fellow Funkadactyl Cameron. On the July 22 episode of Raw, Eva Marie along with the cast of Total Divas appeared on Miz TV, where she slapped “The King” Jerry Lawler claiming to make a name for herself, thus turning heel in the process. The queen finally gets her own fanbase on here . I am a little excited . Second* coolest people on earth, but that's besides the point. I'm thankful to have you, baby. She is like Jean Gray. That's right. Katie, Brandon, and Eric aren't online. I love this girl! Really can't wait to see what she has to offer. It'll be exciting to see her grow. I don't know why, but I have a feeling she'll be big. Should I add you to her stanbase or are you not there yet like the rest of this community? I'm there. You can add me. I'm an EvaMarier or whatever this fanbase is called. This person on DD said she's going to call it "The Mariens", like Marines. I hope she does! I'll name the fanbase that because I love the name.